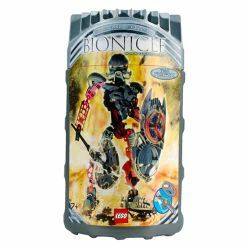 8763 Toa Norik is a Special Edition BIONICLE set that was released in 2005. It was sold along with 8762 Toa Iruini; the only other set that features a Rahaga in its Toa Hagah form. The Toa Hagah Norik set was released in the summer of 2005. This set was only available as a Wal-Mart exclusive two-pack with Toa Hagah Iruini in the United States, but was also sold individually elsewhere. Toa Norik was packaged with a dark red Rhotuka spinner like that of his Rahaga form as well as a silver Rhotuka spinner. Norik's Toa team was charged to protect Teridax at all costs, and dealt with issues that Teridax did not have time for, such as Rahi intrusions. Soon, Norik discovered that the Brotherhood of Makuta had taken the Mask of Light from Artakha and realized the Brotherhood had turned to darkness. In a show of great courage, he led his team in battle against the Brotherhood's recently assembled army and Teridax himself, defeating him and leaving him greatly weakened. Norik then allowed his team to become overconfident, but as a result of this, four of the Hagah were captured and mutated by Roodaka. Realizing this, he set out on a mission to rescue them with Toa Iruini, who had quit the team following Teridax's defeat. They succeeded in rescuing their comrades, but were mutated as well, transformed into short, Rahkshi-faced creatures. This set was included in the Product Collection set 65757 Special Edition Guardian Toa. This set was originally designed as Toa Dume, but it was changed to be Toa Norik. Facts about "8763 Toa Norik"